There’re many reasons to choose Johnny’s Auto Repair for AC car repair. 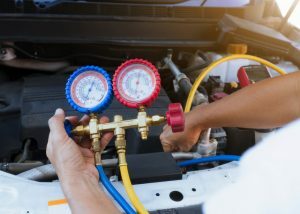 We have ASE certified technicians to provide you with your car air conditioner repair, we are a AAA approved repair shop, are an AC Delco Service center, and even provide a free local shuttle. West Covina drivers know they can trust us for quality repairs and outstanding customer service. Check out this Google review from one of our customers, Don L.
“Clean, quality run shop, with a family-friendly atmosphere. My brother has repeatedly recommended their service, and while this was my first experience, I was not disappointed despite his 5-star build-up. Not only would I recommend their service to someone else, but I am bringing them a second car there tomorrow. Thank you to the entire group at Johnny’s Auto Service for the great service and a quality experience”. We are happy to provide auto AC repair to hybrid vehicles, diesel vehicles, passenger cars, SUVs, 4/all-wheel drive cars, and trucks (light and medium duty trucks, work trucks and vans up to 1 Ton). At Johnny’s Auto Service, we have been providing our customers with top-notch auto repair services, helpful and friendly customer service and a warranty that is hard to beat for more than 35 years! If you prefer to wait while your car air conditioner repair is being completed rather than head back to West Covina, we offer a comfortable waiting room complete with free WIFI and coffee. Give us a call today to get your vehicle scheduled.